The Craftsman 1/2 HP Garage Door Opener delivers smooth, quiet operation and safety in any weather. Whether it’s pouring rain, snow’s piled high against the door or it’s hot and humid, this opener packs the power to open any garage door. With a potent ½ horse power motor and smooth rolling belt drive, this opener reduces noise and energy wasted on vibration. 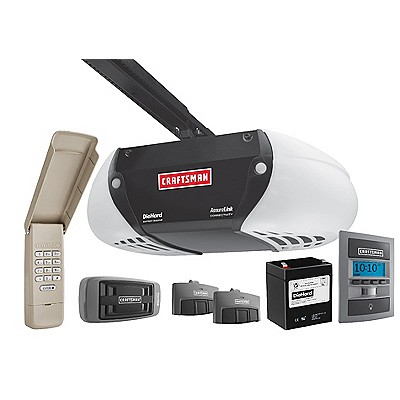 If thoughts of burglary take the fun out of your vacation, this Craftsman Belt Drive Garage Door Opener help’s you rest easy. Featuring a rolling Security®+ Anti-Burglary Coding system, the convenient pin code operated opener switches code with the touch of a button, and built with a manual lock-out button, when you’re away all remotes are disabled, so no matter who’s hands they fall into, your garage will stay locked-up tight. And when you’re looking for superior safety features, this opener delivers up to 200 watts of lighting and a motion sensor system that instantly reverses the closure of the door, protecting cars, toys and children every time you use it. A dependable, safe and secure opener, install this machine at home today and bring the best to your household.